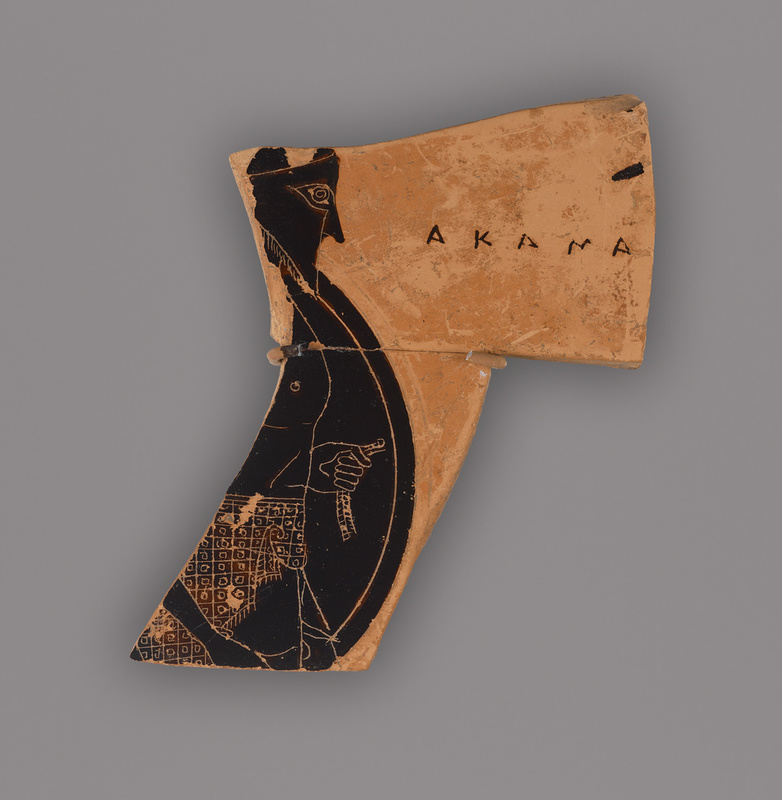 This fragment preserves part of the figure of a bearded hoplite, facing right, with a shield. He is named as Akamas, one of Theseus' sons. He wears a short kilt incised with a chequerboard pattern, and a Corinthian helmet. Bruce McNall, donated to the J. Paul Getty Museum, 1978. Mackay, E. Anne. 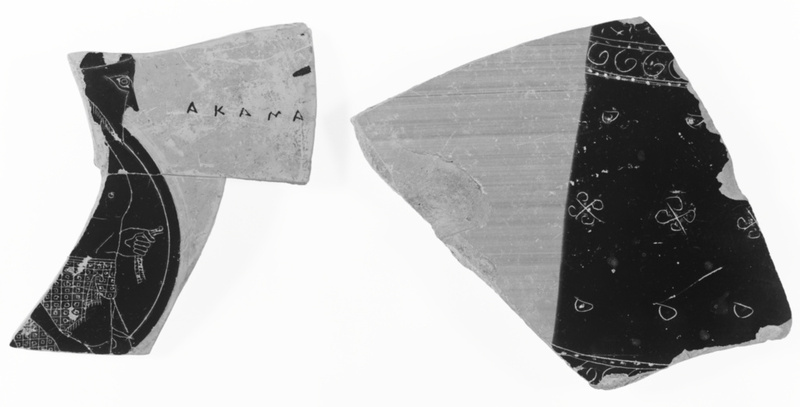 "A New Exekian Fragment," Greek Vases in the J. Paul Getty Museum, 1/1983. Occasional Papers on Antiquities, 1, pp. 39-40. Brommer, Frank. "Herakles und Theseus auf Vasen in Malibu," Greek Vases in the J. Paul Getty Museum 2. 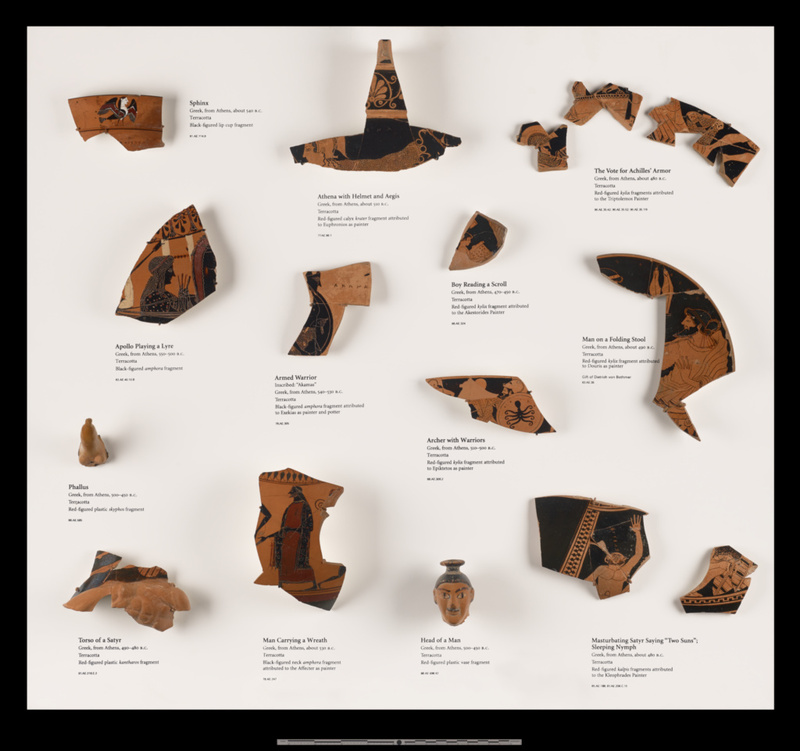 Occasional Papers on Antiquities 3 (1985), pp. 183-228, fig. 47. Neils, J. The Youthful Deeds of Theseus. (Rome: G. Bretschneider, 1987), p. 28, n. 130. Shapiro, H. Alan. Art and Cult Under the Tyrants in Athens. Mainz: 1989, pp. 147-48, ill. pl. 66 d.
Immerwahr, Henry. Attic Script: A Survey. (Oxford: Clarendon Press, 1990), p. 34, no. 145. Tsingarida, Athena. "The Death of Sarpedon: Workshops and Pictorial Experiments." In Hermeneutik der Bilder. Beiträge zur Ikonographie und Interpretation griechischer Vasenmalerei. Stefan Schmidt and John H. Oakley, eds. (Munich: Beck, 2009) 135-142, p.141, footnote 14. Mackay, E. Anne. "Tradition and Originality: A Study of Exekias." Bar International Series 2092 (2010), p. 153-155, pl. 8.